With a dehydrator, you can enjoy fruit all year long! 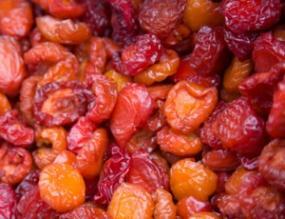 If you're interested in a living foods dehydrator, there is a lot to know before buying one. There are many different kinds of dehydrators. Your needs will dictate which one you should buy. There are two primary kinds of dehydrators available on the market: round tray models and box models. How much food do you intend to dry? There is a large price jump from medium to large models. Do not spend a ton of money on a huge dehydrator unless you plan on preserving bushels of produce at a time. It's a common mistake to buy a 12-tray model when a smaller model will do. Buying too large of a model actually slows the preserving of your food as the same amount of air is circulated in a much larger space. If you are just going to occasionally dehydrate foods to supplement your diet or will do small batches frequently, do yourself a favor and buy a smaller model! Wattage is not terribly important unless you're going to be using your living foods dehydrator commercially.The larger the dehydrator you have, the more wattage you will require because you will need the extra energy to push air over a much larger area. If you really think you will be drying a lot of food, consider getting two smaller dehydrators instead of one. You will end up saving money because you will use less energy to dry small batches, and you decrease the chances of wasting food to spoilage as you hold on to it waiting to fill up your dehydrator. Do you need a timer? This option is often pricey, but worth it if you don't plan on being around for the 12-36 hours necessary to dry some foods. A cheaper option is to buy an outlet timer at your local hardware store, though you should check with the manufacturer of your dehydrator to make sure that its circuitry won't be damaged by having the power turned on and off mid-cycle. Dehydrating foods under 108F keeps their enzymes intact. If you are a home cook and plan on dehydrating food just to supplement your diet, consider a round dehydrator. You can get one of these for under $100, and it will dry small amounts of food just fine. One downside of this type of model is that they don't dry evenly since the trays are stacked on top of the fan, and the ones furthest away from the fan do not dry as quickly. You can remedy this by rotating the trays a few times throughout the drying process. This is a great option for a home enthusiast who doesn't plan on drying tons of food, such as a raw foodist or fruitarian would. For a more professional user, serious enthusiast, or raw foodist, you might consider a box dehydrator for drying larger quantities of foods at once. Box dehydrators tend to be more efficient because their shape allows for more even airflow, but they are also more expensive ($200+). They can dehydrate a lot of food all at once, and tend to dry more efficiently because the fan is located in such a way that it blows across all shelves evenly. Another nice thing about box dehydrators is that they're easy to stash under a table or shelf, and look very much like a piece of furniture. In case you're curious, the model that most people consider top of the line is Excalibur. This dehydrator comparison chart outlines several models available to consumers, and lists the pros and cons of each. More tips on buying a dehydrator. 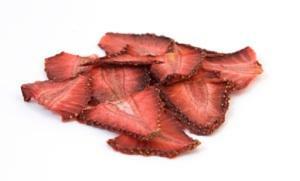 Once you've got your dehydrator, here are some recipes to try out.